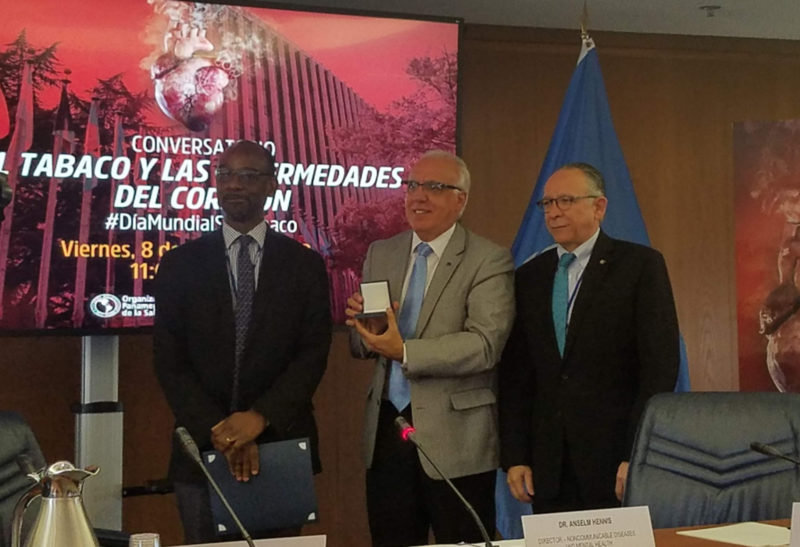 The World Heart Federation (WHF) is delighted to congratulate our close collaborator Dr Eduardo Bianco, Regional Coordinator for the Americas at the FCA on his WHO World No Tobacco Day 2018 award for his continued efforts in tobacco control. Dr Eduardo Bianco is a Medical Doctor based in Uruguay. Having obtained a postgraduate in Cardiology, he trained as a Tobacco Treatment Specialist and has a Master in Addictive Disorders Prevention and Treatment. He worked in clinical intensive care as staff in a Medical Emergency Mobile System for almost 20 years, and as a clinical cardiologist in a coronary care unit (CCU) until November 2015. In 1994 Dr Bianco started to work in smoking cessation and in 1997 initiated the first Tobacco Dependence Treatment (TDT) Program in a pre-paid institution of the Health Care System. Since 1998 he has gotten strongly engaged in tobacco control, as an advocate at national, regional and international levels. In 2000, Dr Bianco promoted the creation of a Tobacco Control Commission at the National Medical Association (Sindicato Médico del Uruguay-SMU) to support WHO-FCTC process, and chaired it. Since that time worked with the FCTC process, first at regional level and in 2001 as Framework Convention Alliance (FCA) Regional Coordinator, participating in Geneva negotiations. Since 2002, Dr Bianco was appointed for a pilot project aimed to promote FCTC ratification in Latin American countries, supported by AHA, ACS, ALA, CTFK , PAHO and IAHF. For this cause, Dr Bianco organized and held multiple tobacco control and/or smoking cessation training events for NGOs and government representatives. During these years, he met Presidents, Ministers of Health, Tobacco Control Focal Points and spoke at many National Congresses, and participated in many media interviews. In 2004, Bianco initiated a tobacco dependence treatment (TDT) program at the National Resources Fund that in 2005 became the basis for the national smoking cessation network. And since 2005, he is a crucial member of the Tobacco Control Advisory Commission of the MOH of Uruguay. In 2006, Dr Bianco contributed to the creation of a Tobacco Epidemic Research Center in Uruguay (CIET) and was elected as its President. CIET is a non-profit organization that not only plays an important role in Uruguay but also in Latin America in research as well as on tobacco control advocacy. CIET has been the local partner of the International Tobacco Control Policy Evaluation (ITC Project) and Dr Bianco participated as principal investigator (PI) since 2006 to 2014. ITC-Uruguay is a cohort study of 1.400 smokers, from the capital city to 4 inland cities, and has been key for showing the impact of tobacco control policies. CIET also organized an Innovative Youth Exhibition that was recognized by the WHO Director General at the time, Dr Chan, who requested CIET to take it to the Conference of the Parties-3 (COP-3) in Durban, South Africain 2008. In the last few years, the CIET in cooperation effort with School of Public Health of Texas University (USA) is running a 5 years research project (Preventing tobacco use among adolescents in Uruguay: Project Activate), funded by the National Institute of Health (NIH), to study the impact of physical activity on tobacco consumption in young people. Dr Bianco is one of the PIs at the national level. In 2007, he promoted the creation of the Tobacco Epidemic Research Centre in Uruguay (CIET), and became its President. CIET played an extraordinary role in Uruguay’s tobacco control development, advocating but also conducting significant research as the First National Tobacco Consumption Prevalence Survey (2008) and the evaluation of the impact of SFE on AMI admissions (2010). Dr Bianco also chaired the WHF- Policy and Advocacy Committee between 2011 and 2016. Since 2011, he has been engaged in NCD control and has promoted the development of the NCD Alliance in Uruguay in 2011. He currently co-chairs this network. Dr Bianco has been awarded on many occasions, at national and international level, due to his tobacco control activities, including the Luther Terry Award by his outstanding leadership in tobacco control at the 16th World Conference Tobacco or Health in March 2015, in Abu Dhabi and recently he has received this WHO WNTD 2018 Regional award.